IDEX Corporation IEX further strengthened its inorganic growth trajectory with the acquisition of the intellectual property assets of St. Louis, MO-based Phantom Controls. The buyout will fortify the company’s premium water-flow and control-systems’ product portfolio. Phantom Controls owns an innovative pump operation technology — Scene Apparatus Manager (S.A.M.) The technology aids in lowering operational complexity and enhances fire ground safety at times of mission critical response. IDEX stated that Phantom Controls’ S.A.M. technology will complement the existing water-flow offerings of its Akron Brass, Hale Products and other Class 1 Electronics brands. Phantom Controls’ business will be included under IDEX’s Fire & Safety/Diversified segment. We expect that the buyout will help drive the segment’s revenues in the quarters ahead. Notably, the segment’s top line improved 15.9% year over year in first-quarter 2018, primary backed by new program wins and product launches. IDEX currently carries a Zacks Rank #2 (Buy). Over the past six months, shares of the company have rallied 2.8%, as against the 9.6% loss recorded by the industry. The company is poised to grow on the back of overseas business expansion, stronger innovation, acquisitions and improved liquidity. 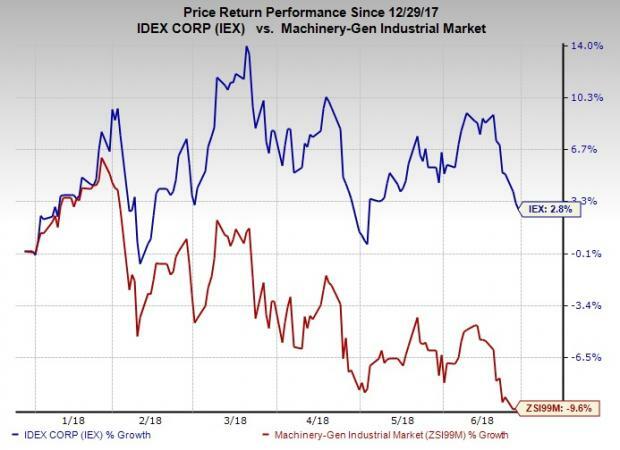 IDEX pulled off an average positive earnings surprise of 3.12% over the past four quarters. Notably, the company’s projected year-over-year earnings growth rate for 2018 and 2019 is 20.2% and 8.6%, respectively. Chart Industries, Inc. GTLS sports a Zacks Rank #1 (Strong Buy). The company’s earnings per share (EPS) are predicted to be up 26.9% in the next three to five years. You can see the complete list of today’s Zacks #1 Rank stocks here. Graco Inc. GGG holds a Zacks Rank #2. The company’s EPS is estimated to rise 10.3% over the next three to five years. Illinois Tool Works Inc. ITW also carries a Zacks Rank of 2. The company’s EPS will likely be up 10.1% during the same time frame.